Editor’s note: Brig. Gen. John H. Johns (USA, ret.) serves on the Council for a Livable World Advisory Board and is a former deputy assistant defense secretary. Angela Canterbury is the executive director of the nonpartisan, nonprofit Council for a Livable World and Center for Arms Control and Non-Proliferation. The views expressed are their own. World powers announced late Friday the need for an extension of negotiations as diplomats work to achieve a comprehensive deal on Iran's nuclear program. This is an opportunity we can’t forgo. Diplomacy must be given the chance to succeed, lest we live with the probable consequences of failure: an Iranian nuclear weapon or another disastrous war. In fact, diplomacy has already yielded results – Iran has met all of its commitments under the Joint Plan of Action, which took effect in January. Since that time, real progress has been made in scaling back Iran’s nuclear program, and intrusive inspections of its nuclear facilities have taken place under a more effective verification regime. These inspections have given the United States and its allies unprecedented insights into Iran’s nuclear facilities. Further, Iran has significantly dialed back its nuclear activity. Its stockpile of dangerous enriched uranium has decreased from 195 kilograms at the outset of the deal to just 4 kilograms in June – a 97 percent drop. We’ve come a long way toward our goal of preventing an Iranian nuclear bomb. But we need a long-lasting agreement. And to achieve that, we must keep Iran at the table. It’s reasonable that negotiators need more time to settle on the details of what will undoubtedly be an extremely complicated settlement. And Iran’s compliance thus far suggests that its leadership is committed to this process, and that extending the talks offers real hope for success. Of course, hawkish detractors in Congress can be expected to continue to try to derail the ongoing negotiations by pushing for more unilateral sanctions. But we cannot sanction Iran into abandoning its nuclear ambitions. If that were so, Iran already would have capitulated. After all, sanctions have been an effective tool for getting Iran to the negotiating table. Now we are at the table, and we need to stay there to complete the agreement. We also cannot allow the negotiations to be hamstrung by unreasonable demands, such as those being made in a letter by Senators Bob Menendez and Lindsay Graham. If we undermine the diplomatic efforts, Iran can be expected to return to its former nuclear activities. But even more importantly, we will lose the inspections that allow us to monitor those activities. Nothing could be more dangerous. Without inspections, with no idea of how Iran’s nuclear program is proceeding, we will be operating without information essential to our national security. Not surprisingly, those who pushed us into war in Iraq are calling for military engagement with Iran. After more than a decade of war and so many lives lost – all without truly advancing our national security – this call to abandon diplomacy and a rush to war again are truly implausible. We’ve been down that path before. If there’s one thing we have learned from Iraq and Afghanistan, it’s that military conflicts have unexpected consequences. In the case of Iran, U.S. military action could very likely force Iran’s nuclear program underground and unite Iran’s leaders and people in a dash for the bomb. The nuclear talks represent a critical opportunity to prevent a nuclear-armed Iran, protect U.S. security, and prevent another war. We must give these talks adequate time to succeed. Ultimately, what would you choose? Another war, a nuclear-armed Iran, or another four months of talks for the chance for peace and security? Our political discourses have a serious problem of insight. We can't undergo invading countries then turn around and be critical of others doing it. If we represented integrity we have squandered it. When we sought justice over 9/11 in a blink of an eye we wasted the world empathy through political mismanagement and pointing our efforts in the wrong direction. In a society where such mental process seems to find authority we find great potential for a collapse for what we are and where we are going. In retrospect, the statement by GWB "You're either with us, or you're with the enemy." can now more readily take on a number of underlying meanings and representations. All of which are not very impressive. Washington benefits more from bringing Iran in from the cold, than sticking to its old Cold-War style policies. 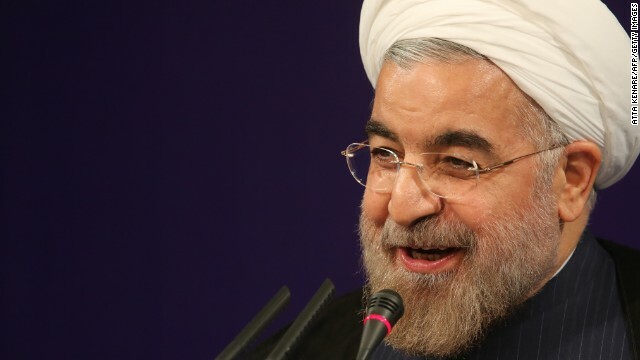 Rouhani is the right person, to forge a rapprochement with the US. It's up to the Americans to put the past behind and reach out to him. Only a stupid, crazy fool would oppose our talking to the Iranians. If we ever hope to reestablish stability in the Middle East, we can't possibly do it without the help of the Iranians! Besides, we need to take back this government from the right-wing idiots in Washington who now run it!!! Israel is vehemently opposed to it. This is why the US will never talk to the Iranians. Another dreamer who is a product of our educational system in the US. The people who oppose us look at history, and apparently our liberal teachers don't teach it. Look at the last time we entered into talks. The Vietnamese used it wisely to just drag things out and they did what they want and they got they want. It's clear that the Iranians are taking a page from that playbook and playing our liberal, coward, naive, moron leaders for dupes. Truth shows. Speak softly and stop whittling our stick. It's astounding that national laws, rules, regulations and policies etc are for the most part upheld and enforced in most countries. Yet when it it comes to some form of global rule ya might as well toss the lot of it down the schitter. The UN is a wuss, the US is a thug, and the rest can run the gamut as it may choose. Our kings and queens can pretty much order the assassination of anyone at home or abroad, but God help us if some joker uses the "n" word or some kid flashes a water pistol out of the back window of a car on the freeway. And here we keep on going again with Iran, not really knowing the truth, not knowing the future, and not knowing what to about it one way or another for better or worse. So where does the solution lie? In power? Always. In money? Absolutely. In agreement? Maybe that too. The world has come a long way and the rate of change is exponential; politically, technologically, financially, environmentally, and perhaps even philosophically. The only thing for certain is that if we do not get our act together globally, and soon, there will be hell to pay for. And it's already started, with or without Iran, with or without Israel, with or without Iraq, Afghanistan, Syria, Libya, Ukraine, Greece, etc, etc, and yes, even with or without America. In the history of human kind and the state, power has been the focus. There have been many power brokers in history and over and over again the pursuit of power has been the end for so many cultures, countries and ideologies. Without a change it would seem human kind is running aground. It seems a joke on us when the most powerful country is tossed around in referrence to America. One might say ironic. Thank you Allan, I have been away awhile and it is relieving to know that someone else does in fact understand, especially given my poor abilities to convey simple notions. In reply, I set out writing a small novel which ultimately led to the recollection of that famous photo of the 1945 Yalta Conference... Churchill, Roosevelt, and Stalin sitting as a collective. But if we took a picture today, what would it look like? @ RS: I think that your novel may sell very well. Good luck on your venture. @ RZ, not RS. Sorry. Talking for talking for ever! Give the Ayatollah the peaceful nuclear bomb with all the all region countries included Bahrain, Iraq, Syria, Lebanon and Afghanistan and lift the sanctions and erase all the Red lines and announce it as a big victory and agreement!! Just more sanctiond force Islamic supreme leader – Khamenei – to give up all his plans including bomb and rocket and exporting terrorists and tension in the ME. It hasn't so far. Iran has been under sanctions since 1980 and since the sanctions increased 4 years ago, they actually quadrupled the number of their centrifuges. The current proposal to Iran is that they ought to destroy all enrichment activity and then west starts gradually removing the sanctions and that may take decades! So if you were Iran what would you do? If they are going to have the sanctions, they might as well drop out of NTP, stop all IAEA inspections and the existing 7/24 surveillance installed to monitor their activity and develop the bomb as fast as they can. A negotiation with aiming results of a total win for west and total lose for Iran, is a guaranteed recipe for a nuclear Iran! At least with the current IAEA monitoring all experts agree that Iran does not currently have a nuclear bomb program. Let's keep it that way instead of pushing them toward the bomb. Specially that they already have the knowledge to make one. Too true @ RZ and welcome back btw! Thanks, my quad-s-ential pal. I am likely only back for a little while, but am pleased that many good people and things remain intact. Thats really to bad @ RZ, you are missed when youre not here. You generally have an amusing way of pointing out the obvious, and many people here especially myself, appreciate that amusement! But...GWB memories are not a favorite for me lol. However misfortunate, I think we can all agree to let such memories fade away rather than get "nookular" with them. @RZ. I hope on some rare occasion those who seem to have such a narrow point of view will read the more "casual" reflections here. I have found an honest view can lead one toward a real perspective. But, to critically think is not as common as what is currently believed. We all seem to want to believe in a form but forget about the details. We define a terrorist but then use GWB's definition without any thought to it's meaning. Non-objective and vastly naive. This Council may be nonprofit, but it is clearly NOT a nonpartisan organization. They are promoting rhetoric. They do not address Iran's track record written in blood. They support and/or fund terrorism worldwide. This includes Hezbollah, Islamic Jihadist, Hamas, Syria and the puppet regime in Iraq. Iran is also directly responsible for the deaths of hundreds of U.S. military in Iraq. This organization doesn't give specifics on what is "unreasonable" about the two Senators' letter. Nor do they name and provide any examples of those who are clamouring for military action in Iran. I have not seen or heard anyone from either side of the isle calling for military action in Iran. Sanctions, yes. Military engagement and war, no. This just is not the case. @ Retired Military is absolutely correct. His use of the term "vastly naive" is what most writers in this forum would benefit from pondering at length. Lol you certainly have a way with words dont you? And as someone who reads everything i can get my hands on, i cant wait for your "short novel" lol. Thanks, but sorry, I'm sure my ranting here is already boring enough to most, so genocide by novella just ain't gonna happen. But in a nutshell, our so called world leaders, not just some but all of them, need to take the initiative to get their sorry asses locked up in a room and collectively agree on where we go from here. Most of 'em just don't have the nads to do it. And hence, they shouldn't even be leaders in the first place. Lol i was referring to your posts here! Brig. Gen. John Johns. You wrote a piece called Why it is right. You said that the issue of Iran getting a nuclear weapon should be viewed from the context of Nuclear non-proliferation. I could not dissagree more. I also could not disagree more with your views on our threat of force towards Iran getting a nuclear weapon. I would question the motives of your reasoning and any administration that supported them. Bassij, the revolutionary guard of Iran Mullah regime opened an account today to buy and send more weapons and rockets for Hamas! As a news junky for years I find it amazing when you talk to the people what we can do to find peace in this world. I just recently sat on a flight from Dallas by an Iranian couple coming to Atlanta on business . The husband here since the 70 went bk to Iran once afraid to go and his wife has sent a few times. Both said that the people there in Iran want peace they love us the Americans. They love our movies , our TV and want to have business again with the World and us? Talked about the battles there and among who or why. He was Catholic, raised his son and daughter . He read the Koran not how he believes and that just a small part has been taken and abused? We talked for a good two hours and this is where we need to be with the real people not the politics , the military that controls. Have a nurse friend who travels the world helping from Rwanda, Bangledesh many countries and she also says the same the people just want jobs and peace leave us alone? Sound familiar.? Saw this am the news guy from Bourdains show done in Iran is in prison WHY? He has said nothing that was negative he only spoke of love of Iran? This is not good to keep this man in prison to show what power you have ? Enough already..
After Iran's 1979 revolution, US decided that its “strategic foreign policy” in the Middle East should be based on excluding Iran from all matters Middle East. Consequently, over the last 36 years since Iran’s revolution, US foreign policy was based on relying on a couple of very unreliable partners to fill the gap after the loss of Iran. Those two unreliable partners are Israel and the collection of Arabic countries (in particular, due to its oil money, Saudi Arabia). As it has become clear from recent events in Iraq, Syria, Yemen and Lebanon, both Israeli and Saudi governments are in cahoots with terror groups of one type or another and consequently have turned the ME into a burning hell over the last 36 years. In the meantime, in the light of Saddam's mischief in 80's, who was encouraged by the US, Iranians did not sit idly and searched and created coalitions in Lebanon, Syria, Yemen, Iraq, etc. to counter the US and its two partners. If the nuclear agreement is successfully implemented, and if Iran is folded into the US foreign policy strategy in the ME, the apparent convergence of US and Iranians’ interests in the ME would produce a better ME for all. As it has been keenly observed by experts, Iranian and US interests in the ME are convergent on critical matters such as ISIS, Al-Qaeda, Saddam's legacy, Israeli expansionist thinking, reliable oil transport routes, etc. These are matters that without Iranian effective participation will create chaos in the ME. However, this new strategy will to a large extent exclude the two old partners (Saudi and Israeli). For example, for Israelis it is apparent that with a peaceful ME, US tax Dollars will no longer flow easily to them. Israel’s economy will most likely collapse, and their expansionist ideas will tank. For Saudis, given the insurgency at home and lack of democracy and competence in governance, the Al-Saud family will struggle for survival and most likely will fall. Therefore, both Israelis and Saudis are doing whatever possible to derail the agreement between Iran and P5+1. With the US-Iran collaboration in the ME, the fall of the two former US partners will have no serious geopolitical ramifications for the US. With all the criticism and blame that was placed on Hillary Clinton for the breakdown in Bengazi Attack, and all the media coverage over her use of a private e-mail server during her tenure as Secretary of State, why wasn't there an investigation into why no US Fighters were scrambled to intercept the highjacked airliners. They were in a holding pattern 100 miles away from DC until the second plane struck the Pentegon. Go to military@e0.email.military.com and click on the link: Where were the US Fights During 911.